Software for Zune music recovery restores music, mp3, mp4 pictures, video files and folders lost due to accidental deletion, corruption, formatting and improper handling of your zune digital music player. Wi-Fi connectivity supporting software is easy safe and read-only utility for your audio video songs music player lost due to human error or any virus infection. 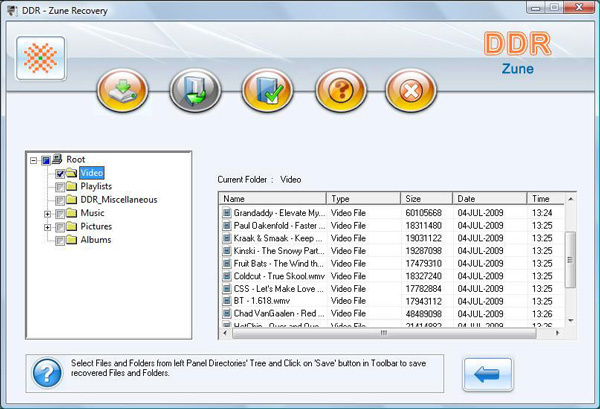 The recovery support asf, aac, mp3, mp4, m4a, m4b, wma and jpeg file formats and reset corrupt music mp3 files damaged or lost due to accidental deletion, corruption and format of your digital media player. Recovers data even if drive not formatted message is displayed by your Computer while accessing Zune Drive in My Computer drive. Restores lost music, video, pictures, songs, file snaps existing on your Microsoft Zune music player. Music/ songs recovery from accidentally formatted Zune memory. Retrieve and rescue corrupted and damaged music files from Zune music player. Unplayable songs recovery due to human error or any Virus generated loss.